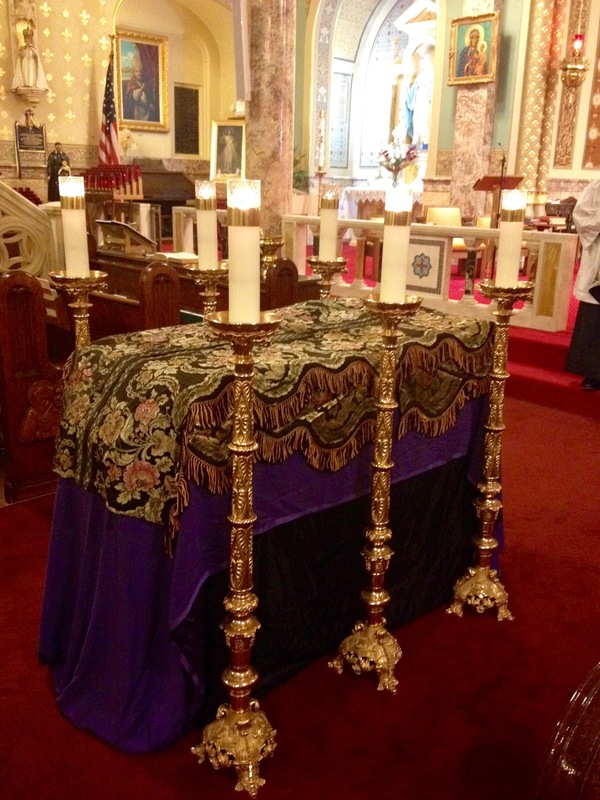 The members of the Saint Gregory Purgatorial Society were remembered at a Missa Cantata offered at 7:00 p.m. at Saint Stanislaus Church (New Haven) earlier this evening. Father John Pikulski prayed the prayers of the Requiem Mass with Saint Gregory Schola Cantorum singing the tradition chants. Do Thou, we pray, O Lord, deliver the souls of Thy servants enrolled in the St Gregory Purgatorial Society from every bond of guilt, that in the glory of the resurrection, they may live again, raised up to the fellowship of Thy saints and the elect. Through Our Lord Jesus Christ, Thy Son, Who being God, lives and reigns with Thee in the unity of the Holy Ghost…. 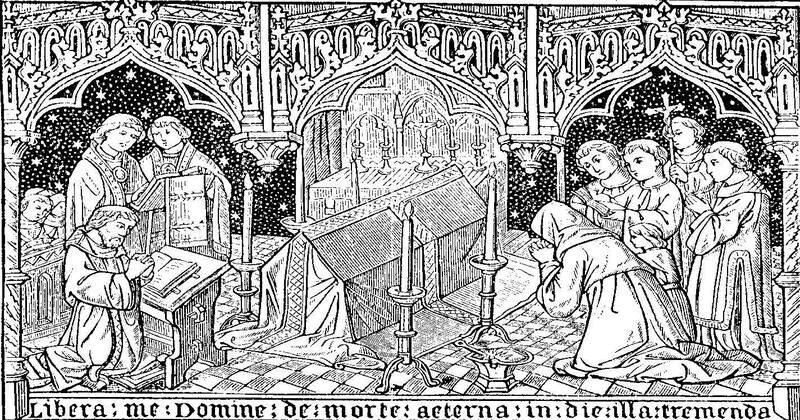 The Saint Gregory Society remembers all those deceased whose names are enrolled in the Purgatorial Society. Since the 11th century the Church has had the practice and desire to pray for the salvation the souls in purgatory. 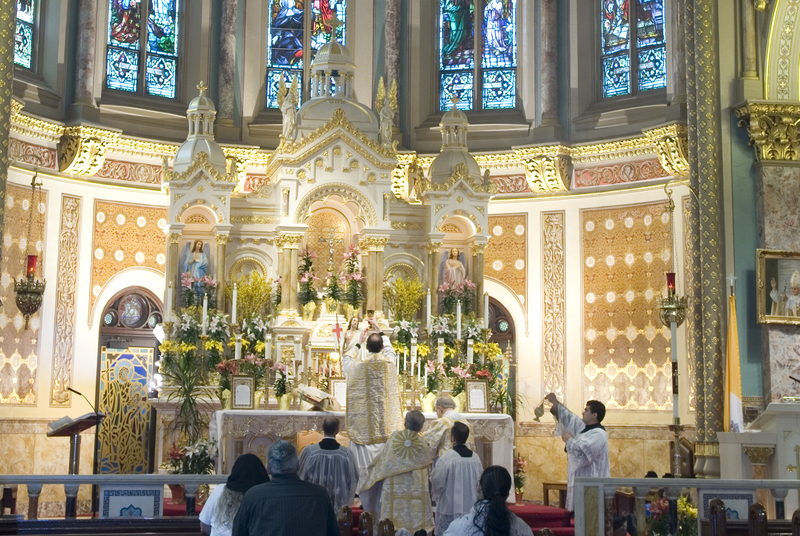 The spiritual benefits of the Purgatorial Society: the person is remembered at every First Friday Mass at 8 a.m. as well as on All Souls’s Day, in the daily prayers and good works of the Society, and at a Requiem Mass (Missa Cantata) scheduled in November. 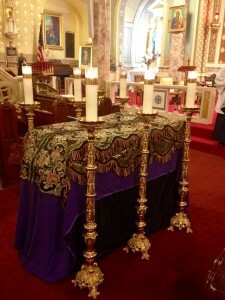 This year the Requiem Mass is on Friday, November 20th at 7:00 p.m.
Those wishing their loved ones’ names to be remembered in the Purgatorial Society ought to submit the names to the Saint Gregory Purgatorial Society, P.O. Box 891, New Haven, CT., 06504. The annual enrollment is $35.00 for the first name, and $10.00 for an additional name. 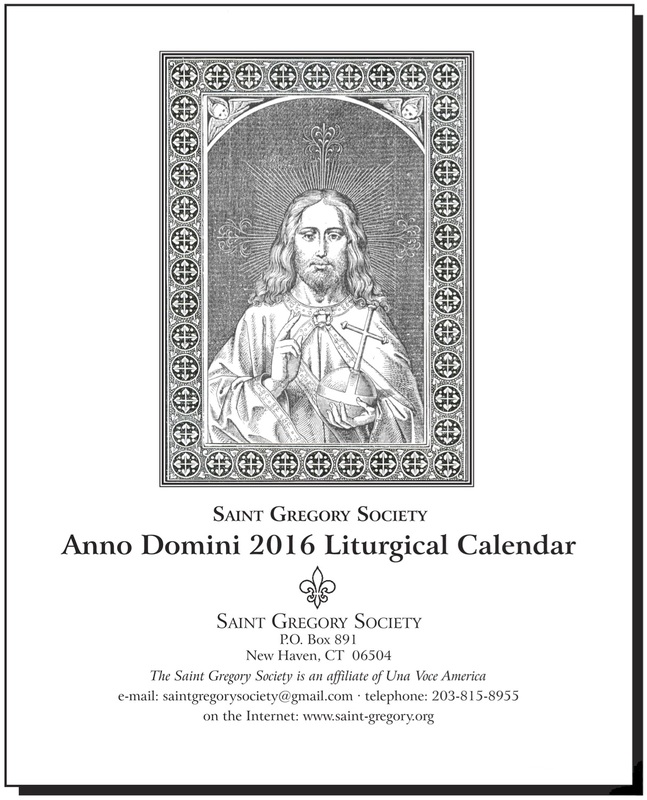 All benefactions support the good work of the Saint Gregory Society. More information visit this page. 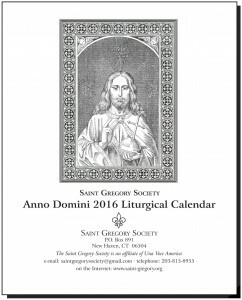 As we approach the glorious time of year in which we celebrate the Nativity of Our Lord, we hope you will consider the publications of the Saint Gregory Society as uniquely appropriate gift items. Our liturgical calendar, Christmas cards, and recordings are one way in which you can “put Christ back into Christmas” this season, and your order will help the Society continue in its mission of supporting and promoting the Traditional Liturgy. You can purchase the calendar, cards and recordings at the Society’s online store. The Officers of the Society wish you a blessed Advent and Christmastide. 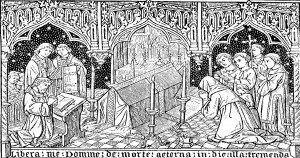 The Traditional Latin Mass will be offered at 5:30 p.m., on Monday, 2 November 2015, for All Souls’ Day. One of the Spiritual Works of Mercy is to pray for the dead. The age-old custom of visiting the cemetery to pray for the dead during November, especially within the first eight days, is a venerable tradition. During the first eight days of November, the faithful who visit the cemetery to pray for the faithful departed by praying for the Pope’s intentions using the Lord’s Prayer, the Creed, and receiving sacramental confession, Eucharistic Communion, receive a indulgence. 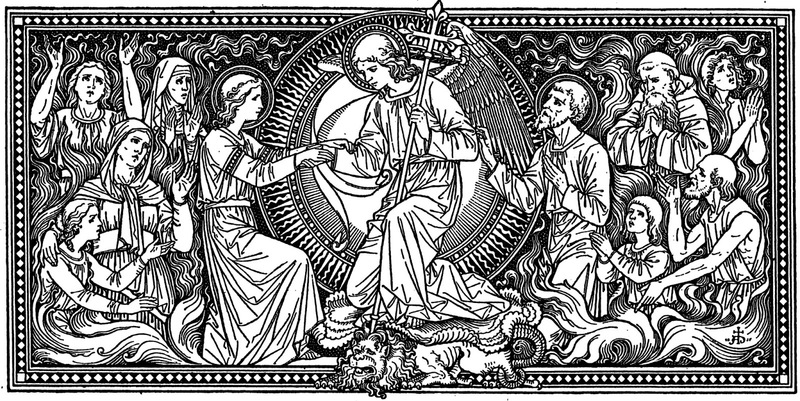 The Catechism of the Catholic Church teaches: “The Christian meaning of death is revealed in the light of the Paschal Mystery of the Death and Resurrection of Christ in whom resides our only hope. The Christian who dies in Christ Jesus is ‘away from the body and at home with the Lord’ (2 Cor 5:8)” (1681). Eternal Father, I offer Thee the Most Precious Blood of Thy Divine Son, Jesus, in union with the Masses said throughout the world today, for all the holy souls in Purgatory, for sinners everywhere, for sinners in the Universal Church, those in my own home and within my own family. Amen. 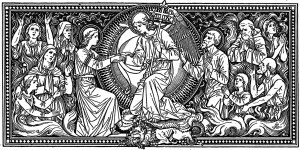 applied only to the souls in Purgatory, gained by visiting your beloved dead, sometime during the week between November 1 to November 8, offering the simple invocation to God for the dead, called the “Eternal Rest” prayer is used: Eternal rest grant unto him/her (them), O Lord; and let perpetual light shine upon him/her (them). May he/she (they) rest in peace. Amen. During your visit to the graves of your beloved, make sure the resting site is properly cared for, sprinkling them with holy water, and adorning the graces with flowers (especially chrysanthemums and marigolds) to symbolize the Eden-like paradise that man and woman was created to enjoy. Welcome to the new webpage of the Saint Gregory Society. Our Society sponsors the Traditional Latin Mass in New Haven, Connecticut, each Sunday at 2:00 p.m. at Saint Stanislaus Church (State and Eld Streets).